Credit notes or credit memo will only be issued several circumstances such as over overpaid invoices, wrong discount rates on items, expired products or simply dissatisfaction from customers. This will result to a sum of money, credited into the customer’s online inventory management system account. It would be hard to keep track when there are many credit notes issued to customers during the course of your company’s operations. You can view the created credit note in BMO Online Inventory Management System by using following steps as shown as below. 1. 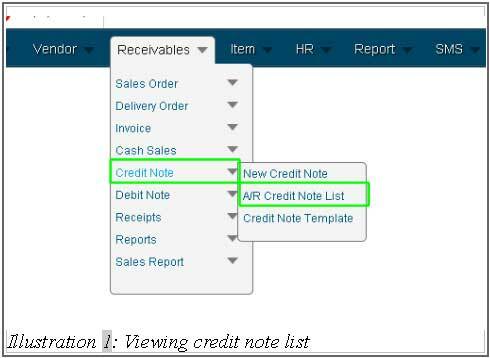 Click on the “A/R Credit Note List” (Receivables > Credit Note > A/R Credit Note List) on the navigation menu bar. 2. Fill in the “Credit Note Filter” by selecting “From Date” and “To Date”, or clicking on the small icon (calendar) beside the text box to choose a date. Besides that, you can also fill in through “Customer” to search by customer. After that, click on “Search” to search the credit note you require. Otherwise, click on “Reset” to reset the search/refreshing the page. 3. After searching the “Credit Note”, you will be able to see the filtered list as shown in the image below. The credit notes page displays all credit note entries by default. Therefore it is advisable to use the filters. Now, click on “Credit Note Serial Number” you require and a printable screen will display to let user print. By the way, user can delete the credit note by click on “Del” and edit by click on “Edit”. Alternate methods will be to click on “View” and “View PDF”.